A Decade After The Hype! In the early 1990s, the American music scene was irrevocably changed by an explosion of bands from one small sector of Northwestern real estate- the city of Seattle. Seemingly overnight bands like Nirvana, Pearl Jam and Soundgarden were dominating radio station play lists with the roaring guitars of angry, disaffected youth, a combination of the sonic power of heavy metal ironically combined with punk’s rejection of commercialization. But like any burst of energy, this dynamic explosion soon burned itself out leaving in its wake shattered dreams, disillusioned bands and more than one causality. 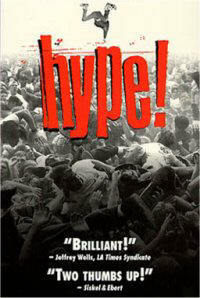 And that’s when documentarian Doug Pray entered the picture, to try and decipher what exactly spawned this musical movement, which had somehow gained the moniker “grunge.” The result is the film Hype!, which was released in November 1996 after winning the Grand Jury Prize at the Sundance Film Festival the previous January. Pray’s film traces the history of the Seattle music scene from the mid-1980s and bands like Young Fresh Fellows to its world-wide explosion less than a decade later. And with that new found popularity came hoards of record companies looking to sign up the latest bands and entertainment press looking for the “Seattle story.” All the while, stores like Macy’s were suddenly milking the musicians’ budget-minded propensity for flannel shirts into a high-end, boutique item. It was a collision between rock music and commerce the likes of which had last been seen a quarter of a century earlier in the Haight-Ashbury section of San Francisco. One part of that Seattle attitude that perplexed many was how many of the area’s musicians seemed to actively resist what they saw as the music industries’ attempts to strip-mine the city of its musical gold. Hype! 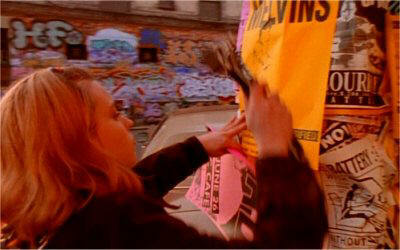 has its origins in 1992, smack dab in the middle of the explosion of the Seattle music scene. Nirvana and Pearl Jam had released their breakthrough albums the previous fall and music industry scouts were scouting every bar and club within 50 miles of Seattle for the Next Big Band. Pray’s friend, producer Steve Helvey had seen some music videos that Pray had directed for the Seattle bands Young Fresh Fellows and Flop and approached him with an idea. Pray knew that although he was acquainted with some of the area’s bands, he was still an outsider and as such, under potential suspicion. “The main reason was just that these people were so cynical, so anti-media,” Pray said. “I know about that, how sick of the whole ‘Seattle scene’ hype that a lot of these bands were. I just thought there’s no way. I finally picked up the phone and called my friends and said ‘Look I don’t know if we’re going to do this movie…’ I was so apologetic just to ask if they were into doing it. And I started realizing that there might actually be a real reason to make a movie like this, to do something that was really different from all the other imagery and concepts that you could find everywhere else. After contacting several bands, Pray and his film crew arrived in Seattle and began shooting several smaller bands on the city’s club circuit. It was Pray’s professionalism that convinced many skeptical musicians of the production’s good intentions. Pray recorded the performances with a 24-track digital mobile recording truck and filmed the performances with multiple cameras. 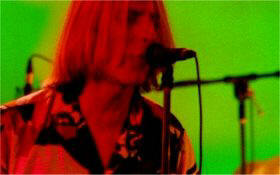 At the time of Hype’s release, Nirvana front man Kurt Cobain’s suicide was still fresh in the memories of music fans. One can’t help feel a twinge of sadness watching Cobain and his band mates at a time when they had no idea of the success they would achieve and eventually become the victims of. But while Cobain’s death was headline news around the world, his passing wasn’t the only death that would shake the Seattle music community. On the evening of July 7, 1993, Mia Zapata, the lead singer of band The Gits, was brutally raped and murdered while walking home. At the time the film was produced, Zapata’s murderer had not been found. Note: This archival interview with director Doug Pray was originally conducted in March 1997 while the director was still doing publicity for his documentary Hype!. Portions of this conversation previously appeared in an April 4, 1997 article in the Wilkes-Barre, PA Times Leader newspaper.